DECEPTIONS: A JAMESTOWN NOVEL takes place in 1617 in Jamestown Virginia when a daring deception leads to dangerous passion in a riveting blend of romance, intrigue, and adventure. 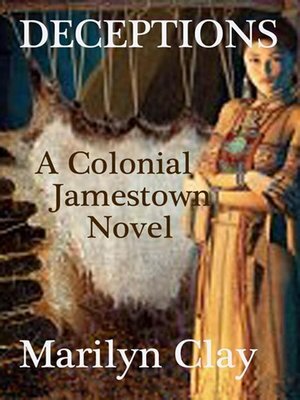 Marilyn Clay's acclaimed Jamestown novel DECEPTIONS will keep you turning pages long into the night. Desperate to escape a marriage arranged by her aristocratic London guardians and to wed her childhood sweetheart, beautiful but innocent Catherine Parke secretly boards a ship bound for the New World. But the shock of what greets Catherine in Jamestown nearly destroys her. Although Catherine knows that adherence to strict moral codes rule the colonists’ lives, she soon discovers that beneath their proper facades not all is as it seems. Disappointments and disasters repeatedly test Catherine's strength and courage, but a burning desire to uncover the truth drives her to unravel a confusing web of lies and deceit. With her own life in jeopardy, Catherine is drawn to the one man who can save her, but wonders if she can trust him, or will she be swept into an unknown and terrifying wilderness, once again loving the wrong man and paying dearly for it? MARILYN CLAY's suspenseful and compelling tale of one courageous woman determined to forge a new life for herself in a frightening and dangerous New World is an irresistible combination of suspense and romance. Vivid historical details bring the Jamestown settlement and Indian villages to life. DECEPTIONS is well researched, fast-paced and brimming with unexpected twists and turns. DECEPTIONS was originally published in hardcover in July 2010 and later released in a large print library edition. MARILYN CLAY is the award-winning author of over twenty books, including twelve novels, two books for children and nine non-fiction titles. She founded, and for sixteen years, published THE REGENCY PLUME, an international newsletter focused on the Regency period in English history. A former University Editor with The University of Texas at Dallas, and a professional commercial artist for many years, she also designed the Romance Writers of America’s RITA award statuette and was presented the first RITA award ever given at the RWA conference in San Francisco the year the RITA was unveiled. Marilyn Clay’s fiction and non-fiction novels are now all available from major e-book retailers on the web. BETSY ROSS: ACCIDENTAL SPY is now available both in print and digital formats as is STALKING A KILLER, a contemporary murder mystery. Historical suspense novel DANGEROUS SECRETS (released in print as A PETTICOAT AND LAMBSKIN GLOVES) follows DECEPTIONS in Marilyn Clay's Jamestown Colonial American historical suspense series. Four young girls travel to the New World on a bride ship in search of love, adventure and a new life, but once in Jamestown are shocked to learn that someone wants them dead!